The writ names the Cyrus's co-writers, Theron Thomas, Timothy Thomas, who are known as Rock City, Mike Williams, Cyrus's manager Larry Rudolph as well as the publisher Sony Corporation of America, and the record label RCA Records, owned by Sony Music Holdings. Flourgon's song We Run Things was released in 1988 and, according to the writ, "became a cultural hit garnering significant sales and popularity both domestically in the Caribbean region and internationally". It was a number one in Jamaica and "met with great acclaim in the United Kingdom, Canada and The USA". The writ claims that May "created the original, creative and unique lyrical phrase "We run things. Things no run we."" It is claimed that the phrase is "distinctly" May's, having its roots in Jamaican patois. 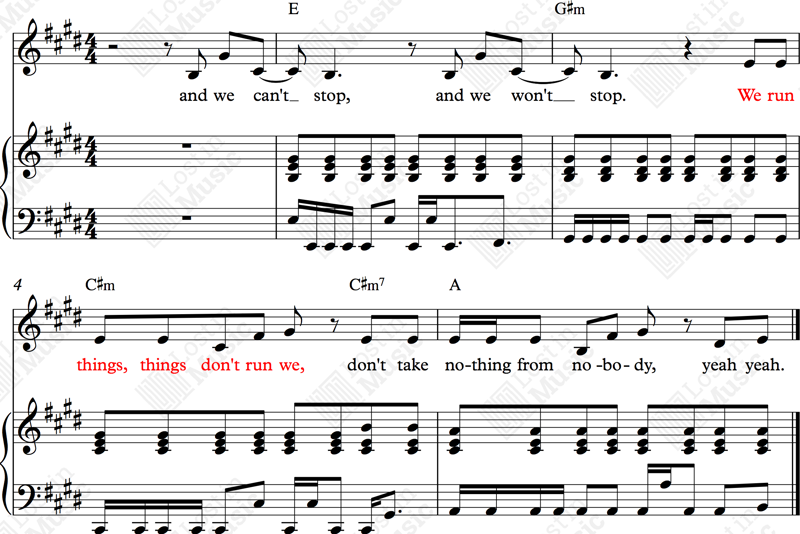 The lawsuit asserts that May was the first musical artist to "convey this unique, creative and original lyrical phrase/sequence into musical arrangement". It is claimed to be "unique and copyrightable". May's song We Run Things "describes an attitude of personal freedom and situational control", "a substantially similar theme/attitude also copied and misappropriated . . . in Defendants' We Can't Stop". The Defendants "unlawfully misappropriated" the phrase in order "to establish an overarching and pervasive theme" for We Can't Stop. The suit goes on to suggest that without the "thrust of authenticity" garnered from the inclusion of the phrase We Run Things, Cyrus's song would "fail to achieve stated success". Cyrus was alleged to have been looking for a new "edgy" approach to life and music, "urbanizing her musical sound". "The Caribbean, and in particular Jamaica, has long been a source of creative inspiration for generations of international artists of all races, creeds, colors and national origin". The lawsuit quotes a Vibe Magazine article from 2015 where Caribbean-born co-writers and co-defendants Thomas and Theron stated "we incorporate Caribbean culture because that's who we are and that's the base of our creativity . . . We pull so many different melodies from Caribbean music because we like to believe Caribbean music has some of the best melodies in music". Cyrus's had already cleared the use of the phrase La Di Da Di, which was taken from Doug E Fresh's song of the same name, and had given a writer credit to Davis and Walters, the co-writers of La Di Da Di, for use of that phrase in We Can't Stop. In order to prove infringement, the claimant will have to demonstrate that he was the first to create and use the phrase in question. There is a suggestion that it was simply traditional Jamaican patois, and not actually written by May. If the phrase is now considered to be in common parlance it will be less likely to attract copyright protection. Miley Cyrus uses the phrase just three times in a song of some fifty lines of lyrics. This amounts to a total of nine seconds in a song almost four minutes long, or 2% of the whole song. The lyrics share some common material, but the melody and musical accompaniment are entirely different. 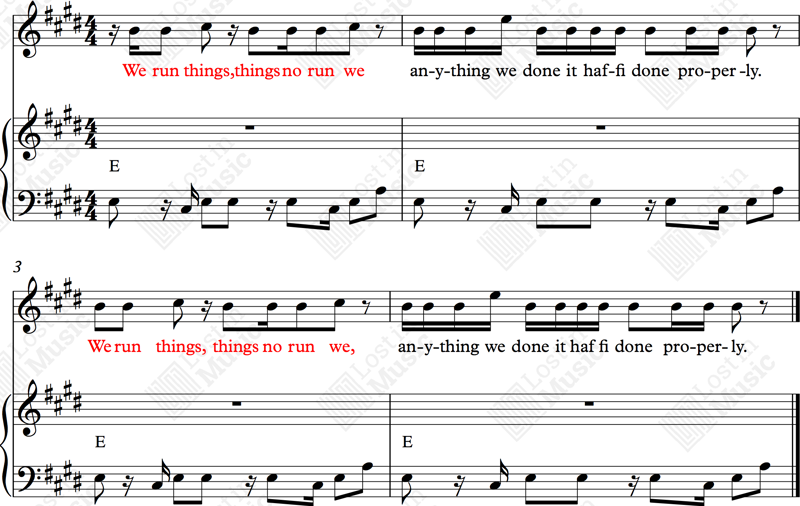 The phrase in question can not be claimed to represent a substantial part of Cyrus's song, either quantatively (as shown above) or qualitatively. (May) © Back 2 Da Future Music. Recording by Flourgon ℗ 1988, Redman International Records. (Williams/Slaughter/Thomas/Thomas/Cyrus/Davis/Walters) © Warner/Chappell North America Ltd/Universal/MCA Music Ltd/Reel Muzik Werks UK/Missing Link Music LLC. Recording by Miley Cyrus ℗ 2013, RCA Records. Vibe Magazine interview with co-writers Thomas and Theron of Rock City discussing their musical influences. NME News Report of case from 14 March 2018, with link to law suit document. Scribd.com link to lawsuit document.